You probably have at least three kinds of painkillers in your bathroom medicine cabinet. But they’re not all designed to treat the same types of discomfort. While some pain relievers are great at bringing down fevers, others contain the ingredients needed to reduce the kind of painful swelling linked with muscle soreness or arthritis. Depending on your medical history — and even what you’ve eaten or drank recently — there may be certain over-the-counter medications you should avoid altogether. 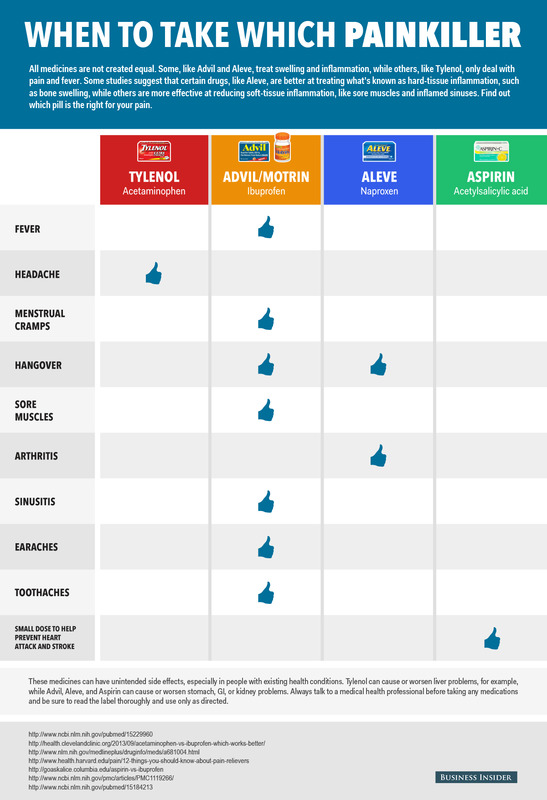 Check out this handy chart to find out which medication is best for your pain. Please note that many of the medications below can treat all of your symptoms. This chart merely shows which drug studies suggest is best at treating which type of pain.